This guide instructs how to properly download and install QZ Tray so that HTTPS is supported in all browsers on all operating systems. Currently Firefox is the only browser that requires any additional steps. The screenshots may look different depending on your operating system and the version of QZ Tray you are running, but the steps in this article should be nearly identical. Install Java 7 or higher from Oracle's website. Note: QZ Tray 2.1 and HTML printing require Java 8 or higher. See detailed system requirements. The following steps are required for Windows, Linux and Mac to gain HTTPS support in Firefox. 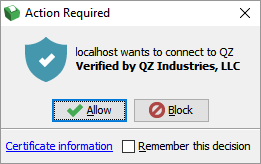 Currently, in order for HTTPS to work with Firefox, QZ Tray must be installed (or reinstalled) AFTER Firefox. The certificate installation is performed when Firefox is opened, so closing all running versions of Firefox is required for HTTPS support. Mac users will need to fully quit Firefox via Command (⌘) + Q. Open sample.html from the demo folder. 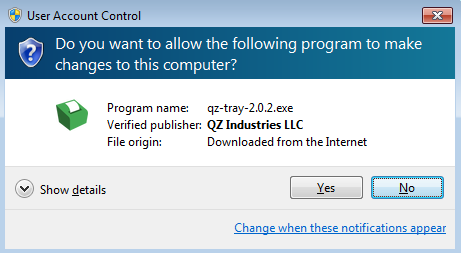 By default, this is located in C:\Program Files\QZ Tray\demo on Windows. If the page is loaded properly, you will now be able to use the buttons provided in the sample.html file. To verify that the connection was established over HTTPS, right click > Inspect element on the webpage and look in the console (at the top). Ports 8181, 8282, 8383, and 8484 are HTTPS connections. Ports 8182, 8283, 8384, and 8485 are HTTP connections. Now that QZ Tray is properly running, you can start integrating the code into your environment!